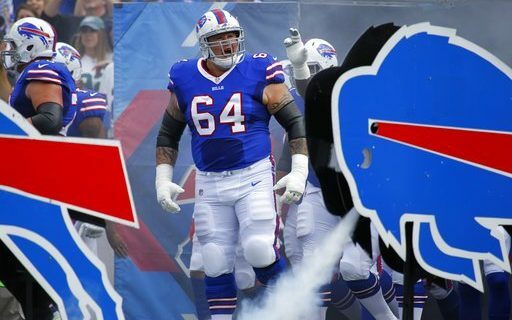 Comedian Jeff Wozer figured out how Bills guard Richie Incognito relaxed during this past weekend’s Bills bye. • Hung out with John Murphy in a duck blind picking off migrating geese with the team’s JUGS machine. • Spent quiet evenings at home drinking growlers of au jus. • Hung out in Las Vegas trying to change the $1,000 bet he made on Sabres making the playoffs. • Spent four days lost in the Great Pumpkin Farm’s corn maze giving him plenty of time to ponder life, death, and the irony of the fact he played for the Nebraska Cornhuskers. • Watched NBC’s Sunday Night Football anxiously waiting to hear Al Michael’s latest ill-advised quip. • Winterized naked woman tattoo by adding parka and ear muffs. • Lobbied league office for permission to carry a Tide stain pen in sock during games for use on stubborn grass stains. • With Halloween approaching stocked up on Lipitor pills to hand out to Trick-or-Treaters. • Made $67 on E-bay selling his collection of Wegmen’s courtesy umbrellas. • Took a speed reading course allowing him to now watch sub-titled movies in fast-forward.